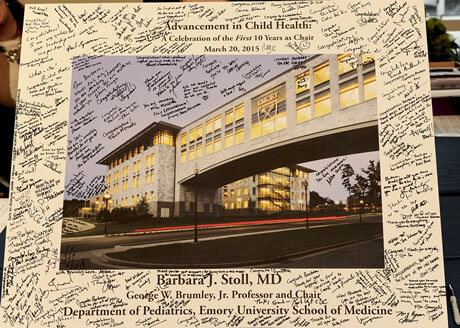 Barbara J. Stoll, MD, has led the Department of Pediatrics in Emory University School of Medicine for 10 years. She has spent more than two decades studying diseases in pre-term and low birth weight infants and has led major efforts to improve birth outcomes and therapies for newborns in the United States and in the developing world. Stoll, who is the George W. Brumley, Jr. Professor of Pediatrics and director of the Pediatric Center of Georgia, was honored March 20 at a symposium and celebration of her first 10 years as Pediatrics chair. Before joining Emory, Stoll served as an associate scientist at the International Centre for Diarrhoeal Disease Research, Bangladesh (ICDDR,B) for four years, where she developed an appreciation of the causes of child mortality in developing countries and studied interventions to reduce mortality and improve child health. She established a hospital-based diarrheal disease surveillance system at ICDDR,B that is still ongoing today. Stoll worked at the University of Goteborg (Sweden) and at the Uniformed Services University of the Health Sciences before joining the Division of Neonatal-Perinatal Medicine at Emory in 1986. She spent 1995 to 1996 at the World Health Organization (WHO) in Geneva, Switzerland, raising awareness of the importance of neonatal morbidity and mortality in developing countries and developing guidelines for the care of newborns in resource-poor settings. Stoll received her undergraduate degree from Barnard College and her MD from Yale Medical School. She completed clinical training in pediatrics and neonatology at Babies Hospital, Columbia Presbyterian Medical Center and Emory University School of Medicine. She was elected to the Institute of Medicine in 2009 and is past president of the American Pediatric Society. She is a fellow of the American Academy of Pediatrics (AAP), a member of the AAP Section on Perinatal Pediatrics and a member of the Board of the Georgia Chapter of the AAP. She was elected to the Society for Pediatric Research in 1986 and to the Infectious Disease Society of America and the American Pediatric Society in 1998. She has served as a consultant to the WHO, CARE, Save the Children, USAID, the March of Dimes and the Centers for Disease Control and Prevention. In 2004, she chaired an Institute of Medicine (IOM) committee to examine ways to improve birth outcomes in the developing world that played an important role in focusing attention on the 40 percent of under-5 mortality that occurs in the newborn period. She is a member of the Executive Board of the Atlanta-based WHO Collaborating Center in Maternal and Child Health, a member of the Board of the Association of Medical School Pediatric Department Chairs, and a member of the steering committees of the National Institute of Child Health and Human Development Neonatal Research Network and Stillbirth Collaborative Research Network. She has authored more than 275 scientific papers, review articles and chapters. Stoll is married to Dr. Roger I. Glass, director of the Fogarty International Center of the National Institutes of Health, and is the mother of three children. A tribute video is available here.